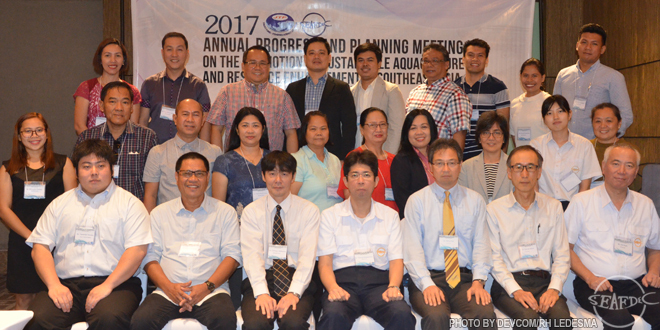 MANDAUE CITY, Cebu – External evaluators applauded the Japan-funded studies of SEAFDEC/AQD presented during the “2017 Annual Progress and Planning Meeting on the Promotion of Sustainable Aquaculture and Resource Enhancement in Southeast Asia,” held here on 9 February 2018. Dr. Tetsuo Fujii, JIRCAS Fisheries Division Director, urged SEAFDEC/AQD to continue striving to be a leader in aquaculture of ASEAN countries. In addition, Dr. Satoshi Miwa, head of Diagnosis and Training Center for Fish Diseases of the National Research Institute of Aquaculture in Japan, said that he was impressed with SEAFDEC/AQD’s work having a vast knowledge on basic research and extension of technology. The studies, funded by the Government of Japan Trust Fund, also got positive feedback from Filipino evaluators. Dr. Simeona Regidor, Officer-in-Charge of the National Fisheries Laboratory Division of the Bureau of Fisheries and Aquatic Resources, said that she appreciated the studies conducted by SEAFDEC/AQD since these studies are relevant and have significantly added to the existing wealth of knowledge. She also recommended that the Community-Based Resource Enhancement project in Molocaboc Island, Sagay City, Negros Occidental should be replicated in other areas since this supports the Philippine government’s program on food security. Moreover, Dr. Crispino Saclauso, professor at the College of Fisheries and Ocean Sciences, University of the Philippines Visayas, mentioned that the research activities undertaken were responding to the needs of time, especially the establishment of environment-friendly, sustainable utilization and management of fisheries and aquaculture resources vis-a-vis the ever increasing demand for animal protein of the burgeoning world population. He also added that the research activities are also in line with the blue growth paradigm of FAO, that is, completely integrating fisheries and aquaculture as interdependent sectors in food production and livelihood generation. SEAFDEC/AQD studies that were reviewed were under the regional program “Promotion of sustainable aquaculture and resource enhancement in Southeast Asia” that is under the ASEAN-SEAFDEC Fisheries Consultative Group Program. One of the projects of this regional program is the “Environment-friendly, sustainable utilization and management of fisheries and aquaculture resources” that deals with the establishment of environment-friendly and responsible aquaculture technology, the promotion of community-based production and resource enhancement of high-value aquatic resources, and the dissemination and demonstration of resource enhancement practices. Another project is the “Reinforcement and optimization of fish health management and the effective dissemination” that is involved in the development and acceleration of rapid and effective fish and shrimp health management, the enhancement of the efficacy of vaccine treatment in tropical cultured species, the establishment of protective measures against persistent and emerging parasitic diseases of tropical fish, the identification of risk factors and development of protective measures against Early Mortality Syndrome (EMS)/ the acute hepatopancreatic necrosis disease (AHPND) in Penaeus monodon, and the extension and demonstration of technology to practitioners, officers, etc. of member countries.